Earlier this week I met up with my dear friend Hillary and we ate lunch as married women. Some of you new readers may not know but she recently got married and it's the first time we've gotten together since her big day! We went out to Olive Garden and had a great time catching up on what has been going on in each other's lives the last few weeks. I've really missed hanging out and talking to her, we spent a little under a year living together in an apartment and she has been a huge part of my life. We both agreed at the end of the afternoon that we would try are best to get together at least once a week from now on! Those pants have alovely color! 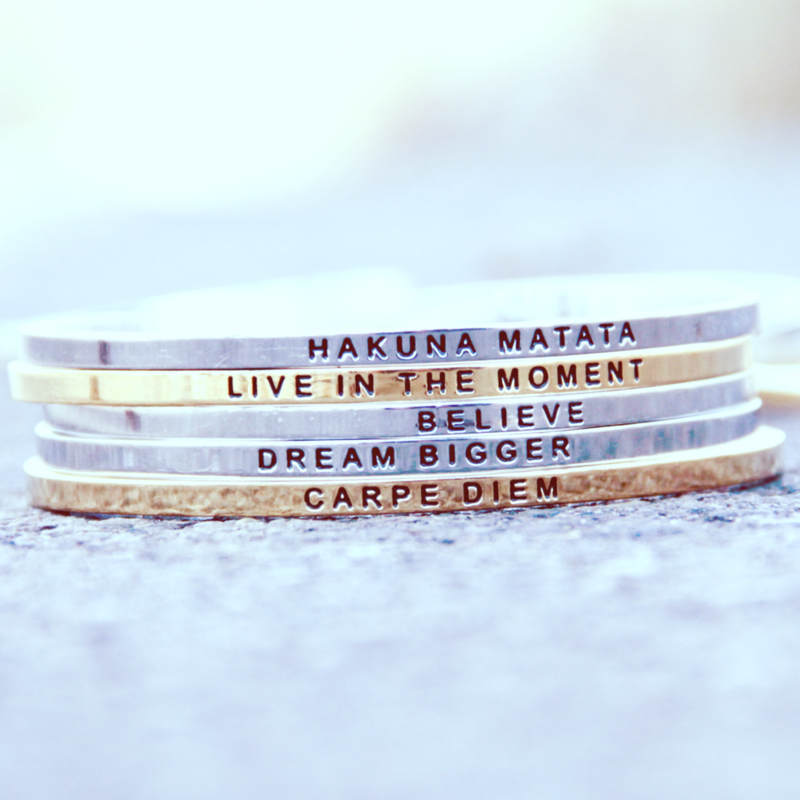 Awww, I love that bracelet, but I like it even more knowing the sentimental value! That top is amazing! What a great color scheme and accessories as well! I've been looking all over for pants like these, they're great! That color is gorgeous with your skin tone, you really wear the colored jean trend well! i love your pants! you're such a trend setter. 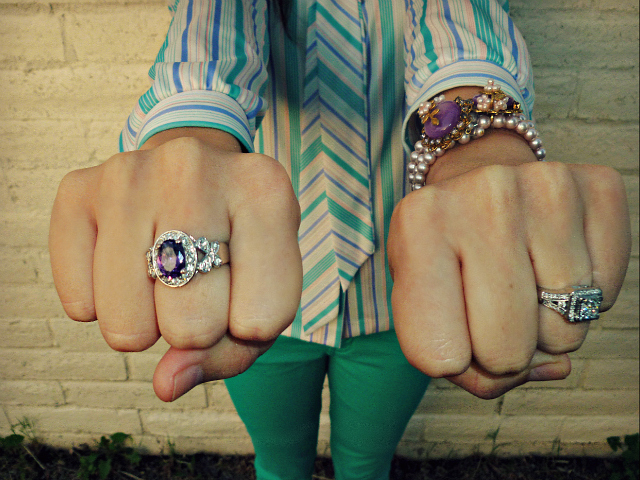 and that picture of you ultimate punching/showing off your rings is nothing short of brilliant. how is it you look good in every color?! Gorgeous!!!!! Love those pants, and your hair is so pretty! very cute outfit, i love your blog! Aw! I love catching up with friends and I also love your mint jeans! I wear mine alllll the time! I love that top!!! that's definitely the type of thing I look for when I thrift. great find! girl, your hair looks great! are you coming over on friday? Oooh, I love that green and lavendar combo! Such great thrifted and new pieces mixed! 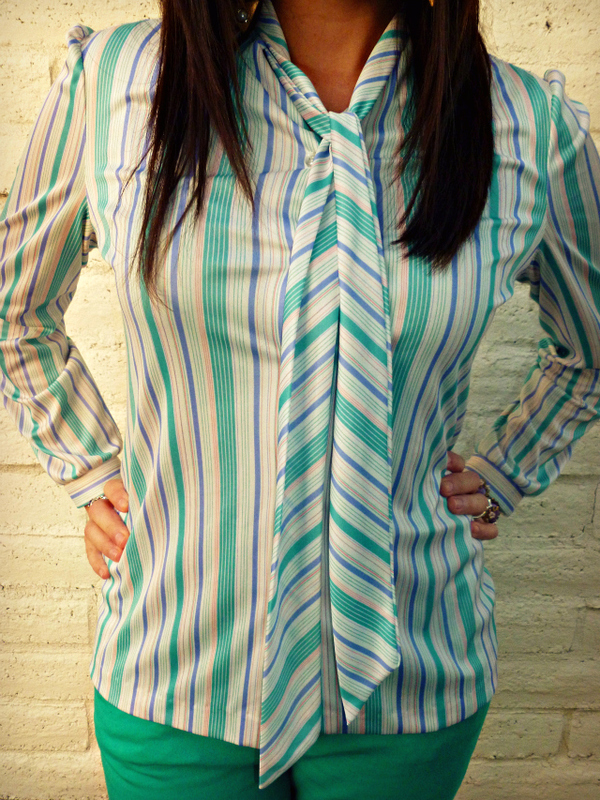 I love the way you styled the mint green pants with this shirt. It is lovely, I can't believe it cost that little. Would love for you to teach me how you find such items. And I love your haircut btw, it looks really sweet. Aw, glad you and Hillary could catch up. Congrats to her! And I just love thrifting! Haha, why buy a blouse for $20-something when you can get it for under $2? Great find! It matches your colored denim perfectly. This mint skinnies fit amazingly on you! I love your mint color jeans I have been wanting to get this color for a while ! thank you for your comment on my blog. I am now following you ! I love when I come to find a new blogger with great visuals and content. I am now following :). I hope you can check out my site: http://theproverbs.net and FOLLOW. Hope to here from you soon. What are darling outfit! I'm loving your blog! 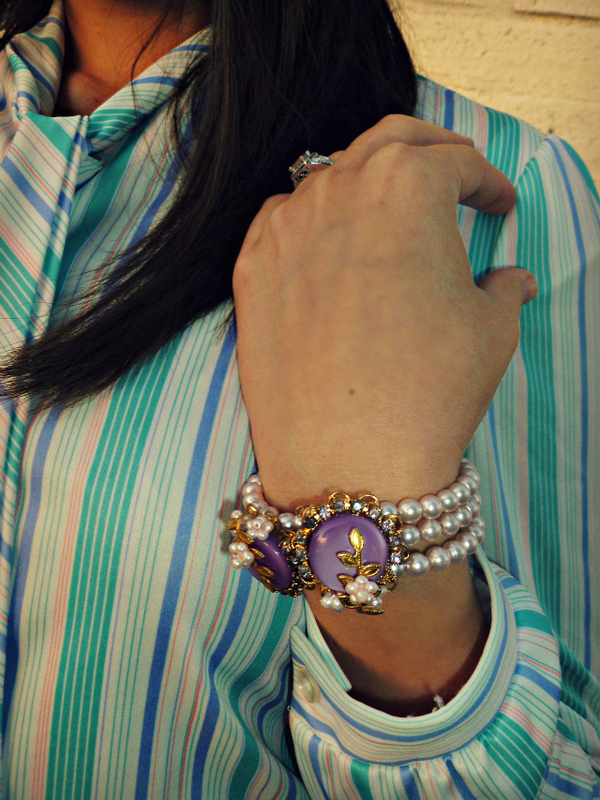 I love that bracelet and those shades of green! Oh I looove this outfit! Yesterday I was telling my girlfriends that I needed to find some green pants asap! Yours looks perfect and I'm glad to see you found it at F21 since it recently opened in Paris (finally!) I absolutely love your bracelet as well: so chic! this blouse is absolutely amazing.... and tjose sandals look so great with the pants. thrifting score! you look awesome. You look so cute! well done this is a great look on you. This is sooooooooo adorable! I absolutely love that top!!! what great (and super cheap) finds!!! the color wave goes incredible with your skin tone!!! and i'm doing a little giveaway, and wanted to share with some of my favorite ladies. you look really really good in mint! I can never get enough MINT in my life:) Love it! You look stunning in all of these photos!